Afro Trek: www.afrotrek.com: Specialize in mid-market safaris across Botswana. Audi Camp Safari:s www.okavangocamp.com: Based in Maun, this is a budget operator offering a range of good value Okavango Delta tours. Crocodile Camp Safaris: www.botswana.com The budget backpackers choice for Maun-focused safaris. Maun Rest Camp: Another Maun-based budget operator, but specializing in mobile safaris to get closer to the action. Ker & Downey: www.kerdowney.com. About as exclusive as it gets – long established super high end safaris in Botswana and beyond. Thebe River Camp: Based in Kasane, these guys arrange boat and overland trips into Chobe National Park. Wilderness Safaris: www.wilderness-safaris.com. High quality safaris in Botswana and across Southern Africa. 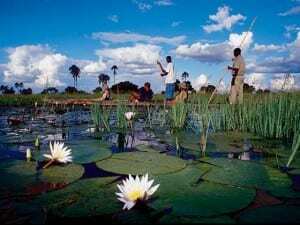 Have a recommendation for a good safari tour operator in Botswana? Let us know. View safari companies in other Africa countries or check out our reviews of national parks in Botswana.